Lead is a naturally occurring element found in small amounts in the the earth's crust. While it has some beneficial uses, it can be toxic to humans and animals and cause adverse health effects. There is a good chance that any home, building, school or daycare center built before 1978 contains some lead paint. Lead can damage nearly every system in the human body and has harmful effects on both adults and children. Lead poisoning is the greatest environmental threat to children in Ohio. Use the USEPA's Home Danger Zone Finder to find likely sources of lead around your home. Interested in having your home evaluated for the presence of lead? We offer an inspection service for a fee. For additional information, contact Mike Adair at (614) 525-3017 or mradair@franklincountyohio.gov. Additional resources can be found in the What You Can Do section below. 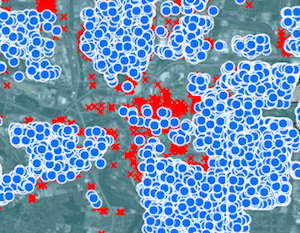 The City of Columbus Department of Public Utilities has created an interactive map to show residents the possible presence of publicly owned lead service lines that provide water to homes, businesses, and other structures. 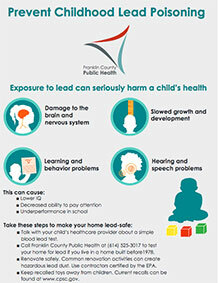 Lead is particularly dangerous to children because their growing bodies absorb more lead than adults do and their brains and nervous systems are more sensitive to its damaging effects. 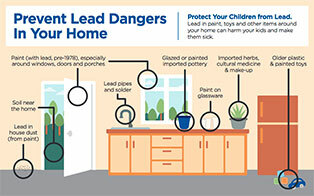 Babies and young children can also be more highly exposed to lead since they often put their hands and other objects that can have lead from dust or soil on them into their mouths. Children may also be exposed by eating and drinking food or water containing lead or from dishes or glasses that contain lead, inhaling dust from lead-based paint or contaminated soil, or from playing with toys containing lead paint or recalled toys. Current recalls can be found at www.cpsc.gov. When should your child be tested? Review the Ohio Lead Testing Requirements and Medical Management Recommendations and talk with your child's healthcare provider about a simple blood lead test. 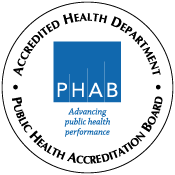 FCPH receives reports from ODH regarding children who have tested positive for elevated blood lead levels. We work with the families to conduct an inspection and help determine what lead risks may be in the home. There is no cost to the family for this inspection. Here are some resources to learn more about lead hazards, poisoning, prevention and safe practices related to repairs, renovations and more. If you are on a private water supply and want to have your water tested, be sure to contact a lab that is certified to test for lead. A comprehensive inspection (using the XRF analyzer and visual assessment) to identify the location of all lead based paint on the interior and exterior of a structure. Collection of dust wipe samples to be analyzed for the presence of lead based paint in household dust. This service is often combined with an inspection. A visual assessment and collection of dust wipe samples after the completion of an lead paint abatement project, hazard control project, or lead safe renovation project. Conducted to verify that all work was competed properly and all areas were cleaned up. Clearance inspection conducted when the Housing Choice inspector notifies the property owner to repair or repaint deteriorated/defective paint in housing constructed prior to 1978. The clearance is conducted after all work on the Housing Choice inspection report has been completed and the area has been cleaned. A written plan to address all lead based paint hazards identified during an inspection. The plan can be designed to abate the lead paint hazard, or control the hazard using interim control measures. Includes an in house estimate and a contractor’s bid sheet. Single room inspection using the XRF analyzer to identify the presence of lead based paint on all painted surfaces in the room. Exterior component tested using the XRF analyzer. Visual assessment and testing with the XRF analyzer to identify all lead based paint on the exterior of a single structure. See the FCPH Schedule of Fees for cost details of each service. Healthy Homes helps residents stop exposure to lead, including education, consultation services, free HEPA vacuum loan, and referral services. Learn more. Lead Safe Columbus works to make sure Columbus has lead-safe affordable housing. The program offers help to homeowners, and landlords for lead-based paint hazard control. Learn more.